Amid classes and studying, good times will fill your days at Auburn. You’ll join a few organizations, maybe a book club, committee or intramural team. Some days, you’ll want to enjoy the beauty of campus with friends or immerse yourself in a cultural event. Or, you may decide to gather your books for an outdoor study session. Year round, Auburn's campus pulses with life, concerts, intercollegiate athletics, impromptu Frisbee-throwing, international festivals, art exhibits and more to fill the campus with color and excitement. 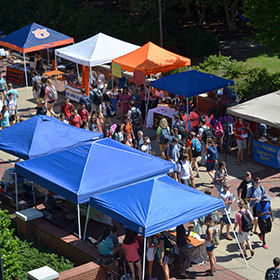 Special events galore to welcome new and returning students to campus for the fall semester and to the Auburn Family! Dating all the way back to World War II, this annual tradition is about greeting one another with genuine Auburn spirit. During Organizations Week (O-Week) students meet organization leaders face-to-face to learn about involvement opportunities or upcoming events. Welcome Week, Hey Day, and O-Week are just a few of the annual events that students look forward to. Throughout the year, you'll find movies, yoga, tailgates and more on the Student Center campus green space. Check out the calendar for upcoming events. Auburn offers everything you need to eat, live, work, and play right on campus. With a multitude of dining and housing choices, you can enjoy the convenience of being close to your classes and the array of activity and fitness options. Plus, Handshake, an employment platform, can help students seeking part-time jobs on- and off-campus. "Auburn's campus is just so beautiful! It was one of the things that made me fall in love with being here – I think sunsets across campus are one of my favorite things about living on campus." Auburn wants you to be happy and healthy. Whether you're working out at the Rec & Wellness Center, joining a health and wellness Program or taking advantage of our counseling services, a healthy, well-balanced lifestyle will help you succeed academically, socially, and personally. Auburn students have many opportunities to explore and develop leadership skills on campus and in the community. With more than 500 student organizations ranging from the marching band to student government, you are sure to find the right place for you. Besides a fellowship of brothers and sisters, the Greek community is active in community service and philanthropy. Academic success is also a priority, and all members strive to excel in the classroom. With 20 sororities and 32 fraternities, there is a place for everyone wanting to join Auburn's Greek Life. These are just a few of the many offices and programs on campus that are dedicated to cultivating the best possible student experience for you. For more campus services and academic support services, see the links below.